Anchorsholme Park is located on the west coast four miles north of Blackpool. The storage project was part of the United Utilities £250m, five year investment programme to improve bathing waters along the Fylde coast. The project was the first of two phases. 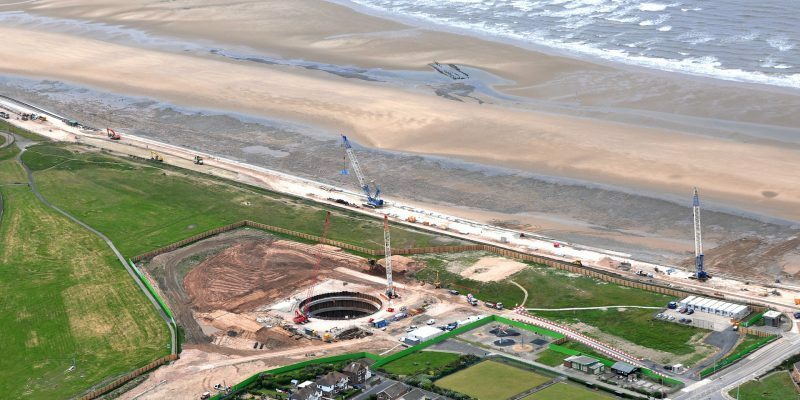 The first phase of work at Anchorsholme Park which started in February 2015, was to construct an underground stormwater storage tank (around 30m deep and 30m in diameter), which would be capable of holding approximately 12,000m3 of stormwater. That’s the equivalent of around 12 million sandcastle buckets. The tank was also connected to the existing sewer network, which included new installation for the sewer and a control unit. This work offered a vital solution to maintaining better-quality bathing water on the Fylde coast. It also provided a more scenic environment giving the local community and tourists a chance to enjoy public areas. Flow into the tank was controlled by the new weir and conveyed to the tank in a 1.8m diameter tunnel sewer. The tank invert is approximately 15m below the incoming tunnel sewer. Twin 1.6m diameter vortex drop pipes were provided to convey the effluent to tank base level to reduce inflow velocities and disperse energy. The vortex drop and scroll design allowed excess flow to overspill the scroll structure, with the lower benching finished with steel fibre reinforcement to provide a hard wearing, durable surface, capable of dealing with the energy from the falling water. To mitigate siltation risk the storage tank has a dual vacuum flushing system which is comprised of a central and a peripheral column. The central column also acts as a load bearing member supporting the roof structure. The shaft was constructed in two phases. The first phase included an installation of a temporary sheet piled cofferdam and excavation to 12m depth, installing three reinforced concrete ring beams at 3m, 8m and 12m depth. This was primarily to act as temporary works support to the cofferdam but also as guide collars to control shaft sinking operations and verticality of the shaft itself. Prior to the installation of the temporary piles the ground along the location was pre-augered close to 16m depth to aid driving and minimise impact of noise and vibration. The upper and lower concrete collars were subsequently incorporated into the permanent works (upper ring beam dowelled to the final wall pour and the lower ring beam attached to the upper via tension columns). This allowed for mobilisation of a soil wedge to help resist flotation and lead to a more efficient design. The second phase involved installing a cutting shoe and constructing a 1.5m thick caisson wall in 2.9m lifts using an innovative travelling wall shutter. Once the wall height reached ground level, the shaft sinking commenced by excavation within the caisson at the cutting shoe. Verticality shaft sinking was monitored using 3No tiltmeters (vertical and horizontal) on the shaft wall at third points. Verticality was controlled within +/- 100mm throughout sinking with final vertical alignment within 50mm tolerance on completion. This helped mitigate risk of trespass on the construction site and the associated health and safety risk to the public; particularly children which drew praise from residents, with over twenty-one WOW awards received throughout the project. We are now well underway with the second phase of the works. This includes constructing a new stormwater pumping station, which will replace the existing pumping station on the promenade. Further works consist of building a new screening chamber and control buildings, along with laying a new extended outfall pipe which would discharge the excess screened stormwater further out to sea. The project is due for completion in early 2019.